Due to its northerly location, Sweden experiences long Winters. 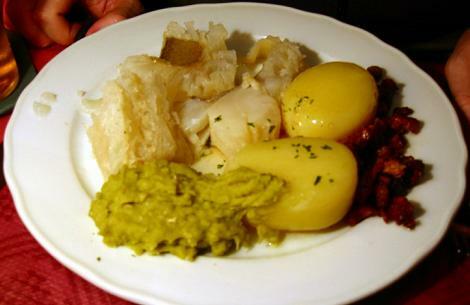 As a result, traditional Swedish recipes often contain relatively few fresh vegetables other than those that would have been available in the Winter months such as turnips (including rutabaga which is native to Sweden, and known in British English as "swede"), potato, cabbage preserved as sauerkraut, or a jam made from lingonberry (a small flowering plant with edible red berries). On the other hand, due to the country's long coastline and seafaring traditions, fish forms an important part of the Swedish diet. On the whole, Swedish food is relatively plain, although some local herbs and spices are used. Traditional Swedish food is also relatively high in saturated fat and sugar, but as most other Western countries, supermarkets are increasingly offering healthier alternatives, such as low fat milk. The traditional Swedish practise is to eat three meals each day - breakfast (Swedish: frukost), lunch (Swedish: lunch), and (Swedish: middag) - with the evening meal being the main meal of the day. However, nowadays it is increasingly common to have the main meal at lunch time and a lighter dinner. Additionally, snacks (Swedish: mellanmål), particularly sandwiches and fruit are popular between meals. Blodpudding - Black pudding - A sausage prepared by cooking blood with filling. Gravad lax - Cured salmon with salt, sugar, vinegar and dill. It is popular as an appetizer, and eaten with a dill and mustard sauce, on bread or with potato. Janssons frestelse - A baked dish containing potato, onion and cream, with pickled sprats (Swedish: ansjovis). Kåldolmar - Rolls made from cabbage filled with pork and rice. They are usually eaten with boiled potato, gravy and lingonberry jam. 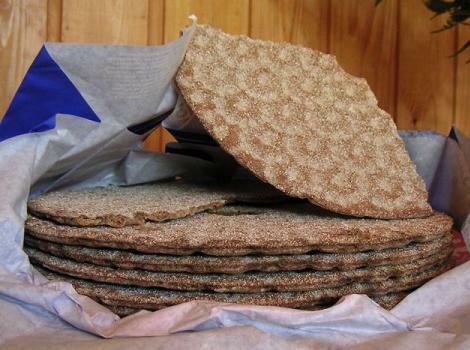 Knäckebröd - A crisp cracker-like bread, made mostly from rye. It is often eaten for breakfast (Swedish: frukost) in the form of open sandwiches which are buttered and then topped with caviar, cold cuts, hard cheese or messmör (cheese spread). Köttbullar - Meatballs made either from ground (minced) beef, or a mixture of ground (minced) beef and pork. Before cooking, the meat is mixed with breadcrumbs and finally chopped onions, and seasoned with salt, and white pepper or allspice. Köttbullar are traditionally served with boiled potato, gravy, pickled cucumber and lingonberry jam. Köttsoppa - A meat and root vegetable soup. Beef is normally used, but sometimes elk or reindeer is used instead. The soup is sometimes eaten with klimp, which are small simple dumplings made from wheat flour, egg and milk. Kroppkaka - Potato dumplings, filled with pork and onions. Served with butter or cream, and lingonberry jam. Lutfisk - An unusual dish made from stockfish (air-dried white fish) prepared using a long process involving soda lye (a caustic soda solution). Pyttipanna - Potato, onions, and sausage or ham, chopped and then fried together in a pan. Smörgåsbord - A buffet-style meal, with many small dishes to which guests can help themselves. Popular at holidays and Christmas, the latter being known as "Julbord". Smörgåstårta - Literally translated, smörgåstårta means "sandwich cake". It is prepared from layers of buttered bread, with fillings in between the layers and a topping. The fillings and topping may vary, but egg and mayonnaise fillings are popular, and they are usually accompanied by one or more of caviar, liver paté, olives, prawns and smoked salmon. Smörgåstårta is served cold, and cut into slices like a dessert cake. 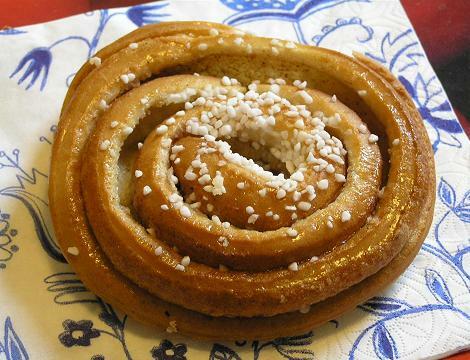 Kanelbulle - A cinnamon-flavored pastry roll. Knäck - A toffee eaten at Christmas. 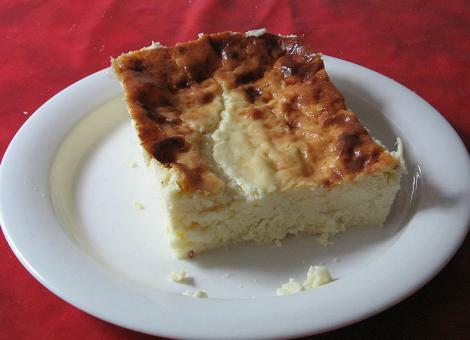 Ostkaka - A baked cake made using curded milk (or nowadays cottage cheese as a substitute). Eaten with jam and whipped cream, or ice cream and fruit. Spettekaka - A hollow cake prepared by cooking on a skewer over an open fire. Served with vanilla ice cream, dark roast coffee and port wine. Featuring the flavors and foods native to Sweden, such as fresh dill, venison, lingonberries, caviar, and aged cheeses, Caroline Hofberg presents a mouthwatering collection of modern and classic Swedish dishes. From apple pancakes to baby potato salad with asparagus, from cod with horseradish aioli to lingonberry chutney, every recipe offers a fresh interpretation of Swedish favorites. Pulling inspiration from the sea, woods, lakes, and farms, Hofberg shows her true passion for Sweden and Swedish cooking through the simple and entertaining way she prepares new and old classics. Beautiful, full-color photographs will inspire any cook. Charming, lovable, and a brilliant chefthat’s Tina! Sweden’s very own master chef, Tina Nordström, is here to stay with this lavish and delightful cookbook. Forget all the do’s and don’ts that take the fun out of cooking. Perfectionism isn’t a word that exists in Tina’s kitchen, and you certainly don’t need a fancy set of kitchen utensils, unlimited time, or rare ingredients to prepare amazing food with this cookbook. Tina opens the door into her kitchen and shares more than two hundred of her favorite dishes. She provides plenty of her tried-and-true tips, shortcuts, and suggestions for expanding your kitchen wisdom and culinary know-how. Using Tina’s simple methods, you can transform one dish into a flavorful variant, reinvent family classics for a new kind of taco night, and jazz up the week’s leftovers with a dash of spice and some fresh new ingredients. This is a book that should be dog-eared and stained with spaghetti sauce, marked up with notes, and covered with floury thumbprints. It’s a book to be loved, pored over, used, and used again. Once you get started cooking with Tina Nordström, you’ll want to live in your kitchen! Scandinavia is a region of extremes—where effortlessly chic design meets rugged wilderness, and perpetual winter nights are followed by endless days of summer—and Fire and Ice proves that Scandinavian cuisine is no exception. Founding editor of Gastronomica and the West’s leading culinary authority on the cuisines of the European North, Darra Goldstein explores the rich cultural history and culinary traditions of Denmark, Finland, Norway, and Sweden. From the bold aroma of smoked arctic char to the delicate flavor of saffron buns, and from the earthy taste of chanterelle soup to the fragrant aroma of raspberry-rose petal jam, this beautifully curated cookbook features over 100 inspiring and achievable recipes that introduce home cooks to the glorious and diverse flavors of Nordic cooking. Endless coasts, impressive mountains, extensive forests - Sweden is a dream destination for many people, with a strikingly varied landscape that entrances every nature lover. And just as rich, clean and unspoiled as the countryside is Swedish cuisine.